When childbirth occurs via C-section, some mothers feel robbed of a crucial moment of their pregnancy. A gentle cesarean section can remedy this situation. When Does Childbirth Require a Cesarean? Often times, cesarean sections are needed when a childbirth situation turns life threatening for either the mother or the baby. However, there are cases where the progression of labor is not fruitful and a cesarean is deemed necessary. In addition, while most common surgery in America is the cesarean section, as in one third of all babies are delivered in this fashion, hearing the news that one is required can be both scary and unpleasant. This is because the idea and experience of a natural birth is a critical moment in pregnancy for some women. While there are more women who want to have a planned caesarean section, some may feel as if they missed a crucial part of their pregnancy by having to turn to a cesarean. It is due to this overwhelming feeling that mothers feel as if they do not have the right to say they gave birth to their child, that hospitals are making significant, although minute, changes to the traditional surgical procedure in order for women to feel as if they gave birth rather than had a surgery. A traditional C-section is a surgery, in which the abdominal wall and uterus are opened. The doctor will most likely make a small, horizontal incision in the skin above the pubic bone (sometimes called a “bikini cut”) to pull out the baby. Typically, in a traditional cesarean section, a curtain separates the field of operation, putting a barrier between the mother and the doctors. It is after the baby is removed from the mother, it is carried away to receive pediatric care, a case of separation that can last upwards of half an hour or more. This also depends on whether the mother has been given a general or local anesthesia (for example, by spinal or epidural anesthesia) and thus has witnessed the birth consciously. The first person to hold the newborn is not the mother, but rather a member of the medical staff. 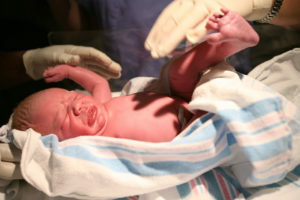 A more gentle method for patients than the classic C-section is the the Misgav Ladach technique. With this method, the abdomen is cut less, but stretched and torn in some places. This technique offers some advantages. After surgery the woman feels less pain and reduced tissue injury, because it’s hardly cut. This kind of C-section also takes a shorter time and the woman doesn’t have to stay in hospital as long as for a classical caesarean section. By tearing apart deeper dermal layers, tissue should be spared in order to ensure lower blood loss. A faster healing of skin is another advantage of this method. The gentle cesarean procedure is more family-centered than a traditional C-section as the techniques used are easy and have simple goals in mind: Allow mothers to see their children being born if they so wish and immediately place the newborn on the mother’s chest for that initial skin-to-skin contact. It is this contact that promotes a bonding experience as well as breast feeding. What Makes a Gentle Cesarean Different? While family-centered cesarean sections are new to a majority of United States hospitals, as many of the doctors have little to no experience with them, it is clear that there are some much needed changes to the standard procedure, although nothing that is overly un-doable. For example, a nurse and neonatal medical team will have to be brought into the operating room, as the newborn will be immediately united with his or her mother, rather than being whisked off to receive pediatric care elsewhere. Other than that, there are a few minor adjustments to the operating room such as moving around the equipment, such as the relocation of the EKG machine from the mother’s chest to her side. While a surgical drape will still be used for creating a sterile environment, women can ask for a clear drape so they may watch their baby being born as opposed to being separated from the events taking place. Even the smallest adjustment like this allow the bond between mother and baby just after childbirth to be formed, as the baby is laid directly on the mother’s chest while the neonatal team resuscitated and cleaned the newborn. Furthermore, the quick behavior inside the operating room allows the mother to begin to breastfeed her child for the first time within moments of birth. When are Gentle C-sections used and not? Due to the recent overhaul to include a more “family-centered” environment in the delivery situation, gentle C-sections allow families to have their first moments together only seconds to minutes after the birth of their child. However, there are certain times when a gentle C-section birth is not possible, as in if complications arise with either the mother or the baby, as you need to remember complications are possible in all surgeries. If a mother requires general anesthesia rather than an epidural, which is a type of area-specific block, she would be sedated throughout the totality of the surgery. Sometimes surgeons are not aware of gentle C-sections; thus, mothers should campaign for this practice for themselves, if that is what they desire. The family-centered C-section is not a replacement for a natural vaginal birth, but it is an option to make the process easier for those mothers who have to receive one.